The safety zone press break is for use against zone presses but can be modified for man as well. Works against full court or 3/4 court. Spacing is key. As the play starts the point guard looks to outlet the ball to one of the post players. Posts are staying wide but coming forward and asking for the ball. Point guard is always trailer. 4 can look middle, sideline, deep, or to reverse. If the ball goes sideline, 3 breaks to the deep sideline, 5 breaks closer to the elbow, 4 heads to the middle, and 1 stays as the trailer. Again, 2 has four options. 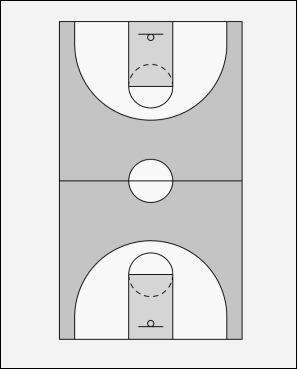 If the ball goes sideline again, 4 will break to the deep sideline, 5 will break to ball side block, 2 goes to weak side wing, and 1 come to the top of the three point arc. If you so choose, you can even run a flex play off of the break. 4 goes around a pick from 5, 5 rolls. 3 passes to 1, who passes to 4 or swings to 2. 2 looks for 4 cutting across. If the ball is reversed back to 1 after the entry pass the following takes place. 3 cuts to opposite sideline. 2 cuts to the middle. 1 will now advance the ball up the middle. Upon being double teamed one of the players in the second line should be open. Earlier process of cutting and passing remains the same. When run and spaced properly it is very difficult to press this offense. Make sure your kids turn and look up court first after receiving the ball. Someone is always open.